Hands up if anyone noticed I’d not posted in a month? Well I noticed, and it was very annoying, because it means I’m really really quite far behind on my daily flash fic posting. So far behind that it’s gotten to a month and a half, (well 44 days to be precise). I’m never going to catch that up, because I don’t think I can commit to daily stories at the moment. It’s never been my style, I’m not a short story writer. Well despite 135 short stories to the contrary. That said, I am really proud of some of them, yes they all need a lot of work – the challenge was not to edit and just keep posting, but there are some real gems in there. Aside from getting bogged down in distractions, apathy, and writer’s block, I’ve enjoyed the challenge for the most part. And it’s succeeded in several ways, such as having the chance to try new things, practice things I’ve never been particularly good at, writing with a little more abandon. It’s also given me ample opportunity to see where my skills are weakest in the fundamentals, (spelling and grammar that I simply don’t get). It’s also more words than I’ve written outside of NaNoWriMo since I started doing NaNoWriMo, and probably from before then too. I’m not done though, although I won’t be trying to keep up with 365 short stories in a year, I am going to post the occasional short story – to keep my eye in for next year, to give me a break from other projects, and to simply test out an idea I’ve got bouncing round in my head. In the meantime I’ve got two pretty big story ideas, neither of which will be saved for NaNo, I want to write them now. I’m in a planning phase at the moment with brain storms and notes scattered all around. I’ve decided which one I’m going to write first, though I’ve written a few lines, (the proverbial foothold in enemy territory of the plain white page), I’m mostly writing out the back story. It’s a fantasy piece and it requires a good backing mythos to really work. I’ll get you next time, Gadget. Next time! Why surprise? Well I’ve surprised myself, we’re now two months into this writing challenge, and I’ve not stopped. I wasn’t entirely convinced I’d stick with it, but I have this far. There’s still 298 stories to go, but it’s been a good start. There’s a lot going on in my life, which has served as quite the distraction. I’ve missed one day – ironically on the least distracting of days. There’s been a fair few days where writing has been last minute. 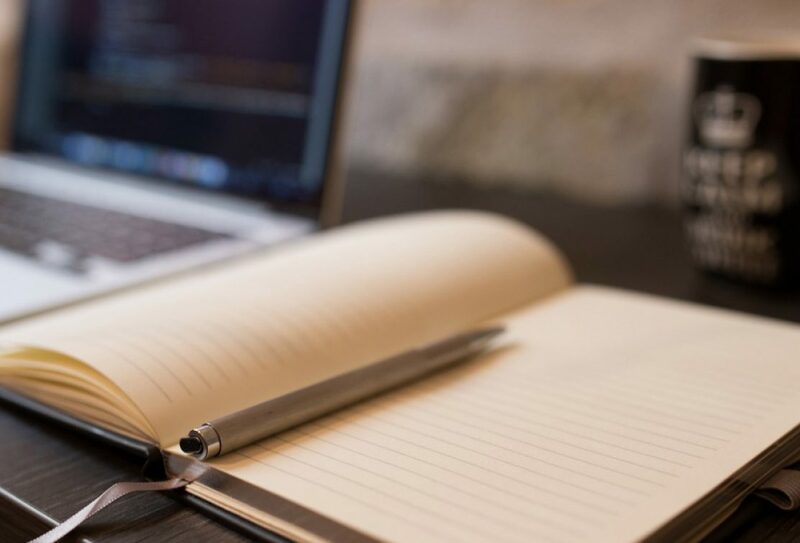 I should offer a word on quality, or lack thereof – the challenge is to write, not edit. The only editing I’m doing is to trim the word count to fit in my maximum of one thousand words. It’s not always pretty, but it’s creative. Well kind of creative – there’s probably twenty ways to armageddon the world. Pleasantly, sometimes bitter sweetly, occasionally tragically it’s been a lot more than destroying the world, I like to think I’ve got some genuine drama, emotion, and fantasy in there. I’m going to be making a list of goals – stories and styles that are off the beaten track for me. Things I might not be good at, but are a stretch. I’m also going to launch a separate but related challenge to edit two stories a week. Two of the Daily Flash Fiction Challenge stories, just seem spelling, grammar, flow editing, maybe do some rewrite to clarify what I intended. Otherwise the main rules of the Daily Flash Fiction Challenge, 500 to 1,000 words, a self contained story, not just a series of chapters. Anyway the upshot is I’m writing and enjoying it. Which puts me in a good place. Usually during November I post every few days about my NaNoWriMo progress, that is until I crash and burn and end up riding the fail train until the end of the month, (though I did win last year). This year has been different, oh yes, on both accounts. First of all I’ve failed to get round to inane blog posts about my progress until now, (now into the final week). Secondly, for the second year running, I missed the connection to the fail train and gained my win early. In fact at ten days, I was on the success train four days earlier than last year. That’s right, choo choo, I’m a winner again! Okay, a grown man putting “Choo choo” in that statement may not sound like a winner, but it felt good, and so did winning. This of course isn’t about rubbing all your noses in my success, (not entirely anyway), it’s about how I succeeded, and what I’m currently up to, (and no its not running round city centre bollock naked going running up to people before going shouting “Choo choo” in their faces – that behaviour gets you sectioned, and NaNoWriMo does not qualify as mitigating circumstances). So, my last NaNoWriMo post before this, that was actually published, (have a whole post on tools that I didn’t publish, which is good as I went a different way), was all about my final decision for project this year. I originally had decided on three possibilities, and had a whole scientifically inaccurate way for deciding which I would go with. 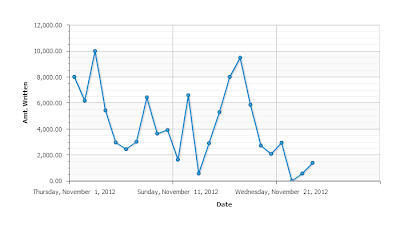 Then October hit, and the Road to NaNoWriMo was in full swing, and I decided I didn’t want to do it. All that planning won’t go to waste, but it’s not being used right now. Instead I had a grand plan for revolution, with a Tyrant in Downing Street. I’m sure you can see the appeal of this given the times we live, and are likely to be living in in the future. It’s tough, it’s exciting, and it’s political. What more can a guy ask for in a novel? So with the planning session for the West Yorkshire chapter of NaNoWriMo, I plotted out my novel, sorted out my main character and time a line leading up to the main events. Then November the 1st at 2:30am (I napped longer than I expected), I got to work on the ambitious story I had in mind. Another reason for choosing this particular story was I did it as a history book, narrated by a single voice, but telling many of stories of the life and times of said tyrant. It meant I didn’t necessarily have to care about continuity, writing in the right order and what not, it’s going to be easy to chop and change in editing. Whole sections can be lifted and moved, or indeed just removed without impacting everywhere. It was quite liberating, so much so with a big first day, and a huge Saturday I was well on my way. I was hoping for a Wednesday night finish, (50k in 7 days, epic), however NaNo crud hit early this year and it threw me off my game somewhat in the first Monday and Tuesday of the competition. It was a distraction I could ill afford for the 7 day 50k. So, I didn’t do it. That said, it didn’t stop me, I carried on when I was better, and won on day 10. 5k a day average? I can live with that. So November 10th was a glorious day, since I won. Unfortunately for my 100k plans, the story lost its traction after that. I’ve stopped it at 52k, and moved onto a new novel, with the aim of doing a second novel in 10 days. So far I’m behind after losing two days to the curse of technology, (my laptop by loathsome ransom ware). The second novel got me to 100k in eleven days, and I completed the 50k for that particular novel on fourteen days. 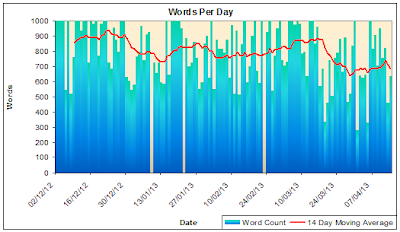 Below you can see a chart of my word counts, per day, up until today. I did my best, but I was no where near consistent. (click the image to see the chart in full size). Neither is finished, but both need a bit of extra planning to tie it all together and finish off. So I’m calling December finishing month. There’ll be three to do, as tomorrow I’m starting another story. This one will be short, about 25k, just to finish off the last week. I’m not worried if I don’t hit 25k, it’s just a bit of fun. 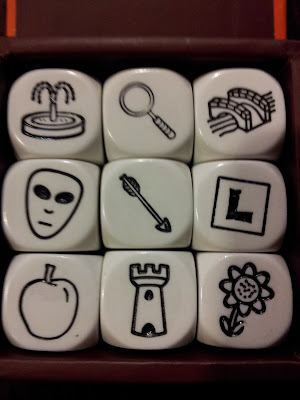 The plot is entirely driven by StoryCubes, (see below for the selection in question). No idea how it’ll work out, and I’ll probably need more StoryCubes at various points to pad out the plot. I have a whole post in mind as to how much StoryCubes helped me, and how I used them, and the fun. So I won’t share my interpretations just yet. I think though I’m going to do a StoryCube story once a month, just for fun. It’s early yet, but I’d hate to forget, so here are the obligatory thank you messages. NaNoWriMo for hosting and organisation the month. #NaNoYorks chat room for its many word counts, and encouragements, and putting up with my plot talks, and occasional boasting. Sparkie, for whom I was desperately trying to race, but out paces me for writing with worrying ease – even hundreds of miles away in her new home. Kerantli, for secretly being the organised and responsible one, and prodding me when I needed to stuff. Rokk, for talks about Bond and plots. My colleagues at work that have put up with me talking about things they have not a single care about. My mum for encouraging me, and my dad for taking an interest in the plot. So yeah, plenty of thanks, and I’ve missed a lot of people out. Some people don’t even realise they’re helping, but they have. I could never have made it through NaNoWriMo these past couple of years without the care and support of all the other WriMo’ers I’ve encountered. I’m stood here on this podium in tears now… but no one’s handed me an award yet. Ah well.